How to Wear White Jeans in Summer + Outfit Ideas to Copy! Are those white jeans in your closet just begging to be worn? Here’s how to wear them for summer, complete with outfits ideas I think you’ll love. When my kids were little, I didn’t dare try to wear white jeans. I didn’t even own a pair because why bother, am I right? But now that I don’t have to worry about peanut butter and jelly stains from cute little toddler hands, I have fully embraced wearing white jeans. Just like with regular denim, you can dress up or dress down white jeans. Two of my favorite ways to wear them are dressed down with Converse and a striped t-shirt or dressed up with a floral blouse and wedge sandals. 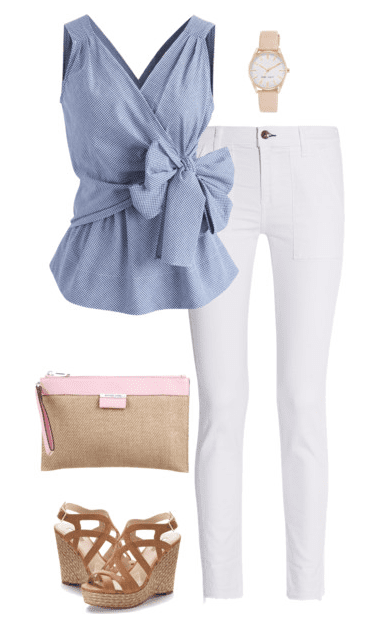 With a chambray shirt and sandals – it makes the blue just pop! Before we get into the specific white jeans outfits, let’s chat about the different styles there are. I know quite a few of you do not like skinny jeans and would prefer more options. Here are a few different styles, all under $50! 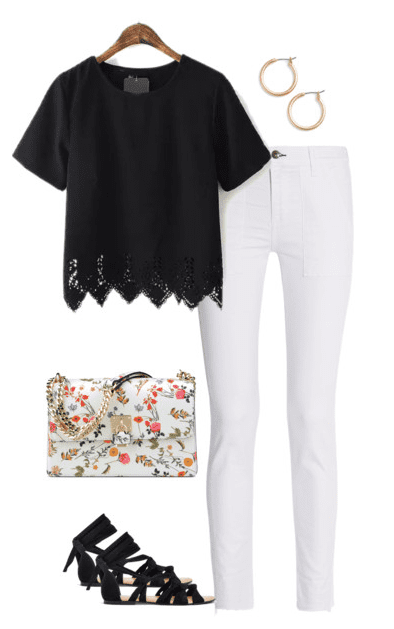 You can find more white jeans styles under $50 HERE. Alright, now for my favorite part and I’m sure yours too. The white jeans outfits! From dressy to casual, I think you’ll find an idea perfect for the occasion. I used the same pair of jeans in each outfit I created, but they’re quite pricey. $159 pricey! But, you can swap out these for some of the ones I linked to above. I asked a few of my blogging friends if I could share their white jeans outfit ideas and as always, they had some fabulous outfits. 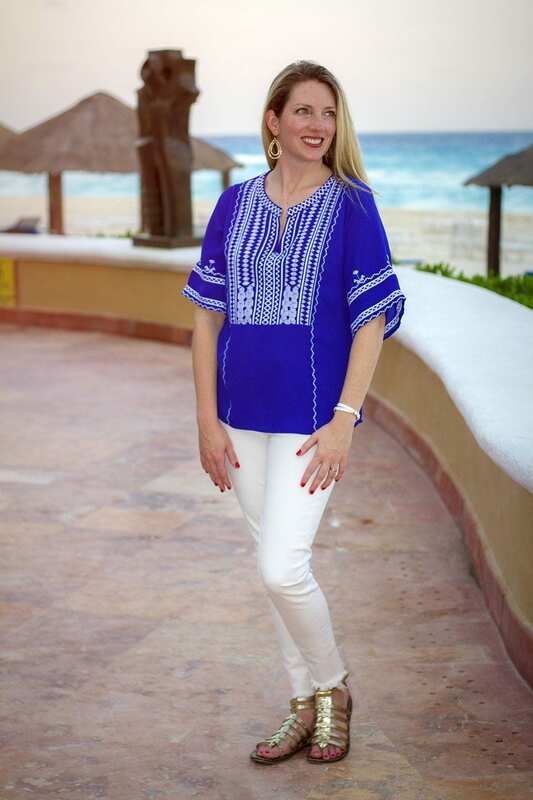 Andrea from Momma In Flip Flops has several cute ideas featuring white denim. I have this same top and can’t wait to recreate this look! 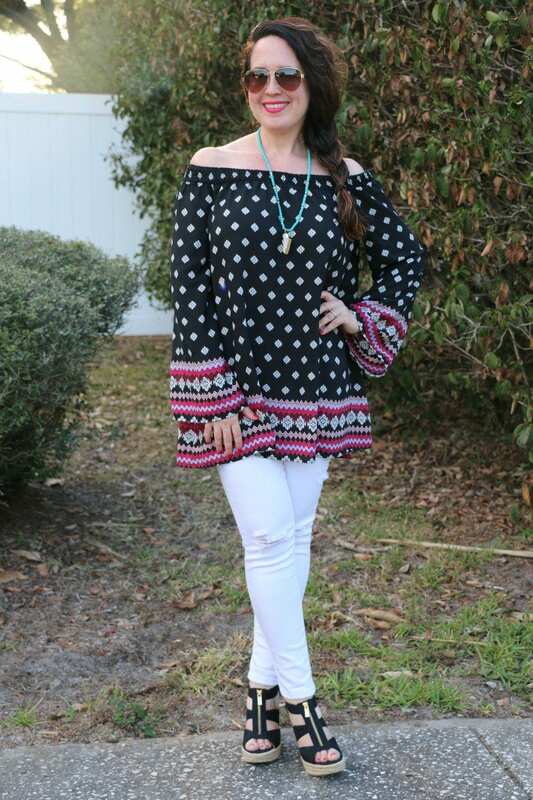 Not only is this off the shoulder blouse gorgeous, but Kristin from Take Time for Style paired it perfectly with white denim and black wedge sandals. 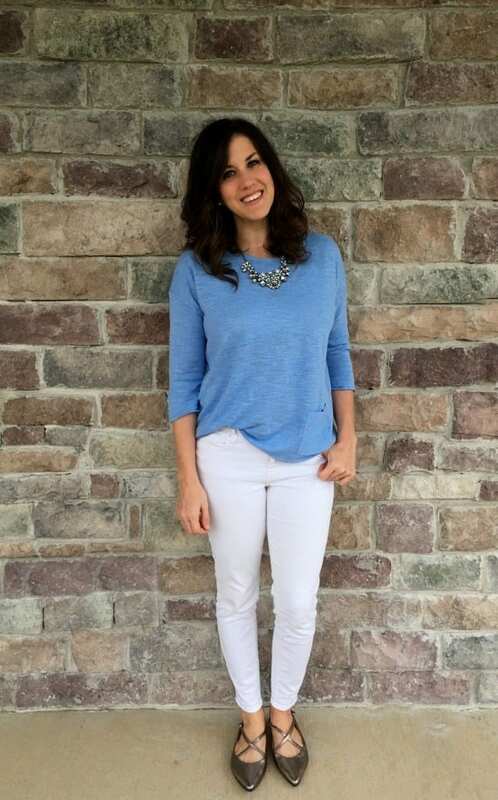 This blue top Megan from Take Time for Style is wearing absolutely pops with her white denim. Beautiful isn’t it? I am also loving the frayed look on her jeans. I thought this was a trend I was going to pass on, but I ended up loving the style! 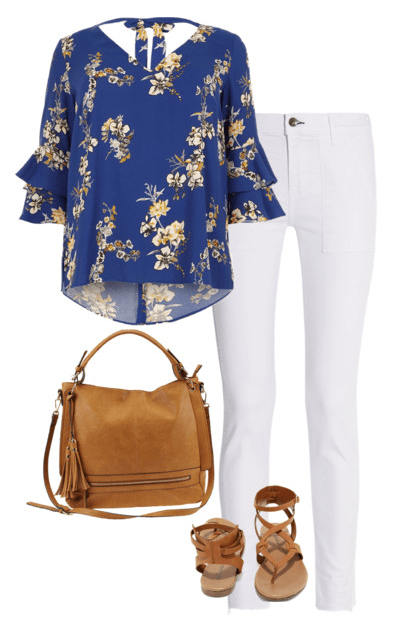 Ellen from That Chic Mom pairs a blue floral cold shoulder top and flats with her white denim. I am officially in love with this look. 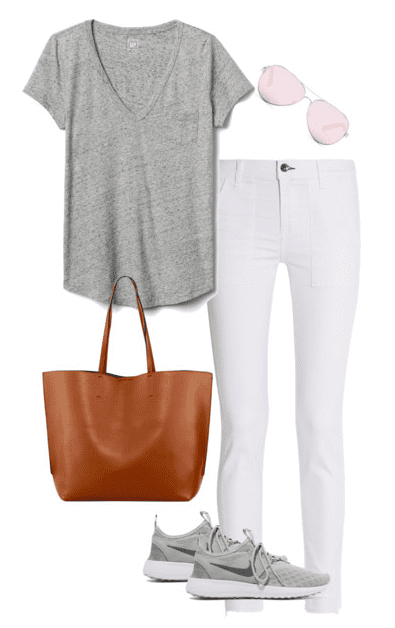 Do you own any white jeans? If so, what’s your favorite way to wear them? Absolutely LOVE this post! I can’t wait to fit into my white jeans again and wear normal tops! I never found a good pair of maternity white jeans. That Chicwish chambray top is stunning- may have to purchase for after baby! Thanks for the great fashion idea’s! Time to start wearing those white jeans a little more! Love all these looks, gives me many more ways to style my jeans. Thanks for the feature! Oh, so many good ideas!! I might wear one today. Thanks for the inspiration and looks into the other bloggers.